FXSound Enhancer is a Windows sound addon which provides you with enhanced audio playback, whether it's while listening to music or watching movies. Upon installing FXSound Enhancer, you'll be presented with some limited options to improve audio quality in the free version. Of course, more features would be unlocked upon registering the application. 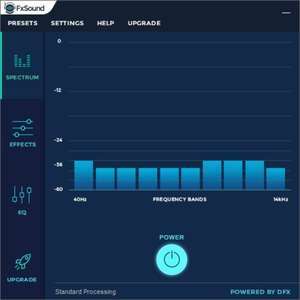 With all of that said, FXSound Enhancer includes Bass Boost, 3D surround sound, HD restoration and some other sound enhancements and modifications. FXSound Enhancer 13.025 is a shareware program and can be used as a demo to try the software until the free trial period has ended. A full version of the program is available after the trial period ends. For security reasons, you should also check out the FXSound Enhancer download at LO4D.com which includes virus and malware tests. Additional screenshots of this application download may be available, too.